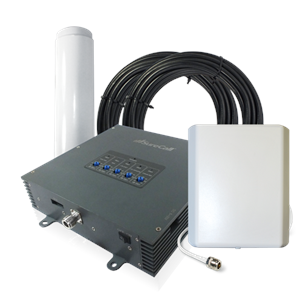 SureCall’s Force5 is a self-contained, five-band, cellular signal booster. The Force5 is an alternative solution to a DAS system at a small fraction of the cost. Modular in design, each Force5 provides enhanced cellular and data reception for areas of 20-25,000 square feet (unobstructed area) with up to 100 users. Ideal for commercial buildings, hospitals, corporate and educational campuses. The Force5 combines PCS and Cellular dual-bands with LTE and AWS frequencies for Verizon, AT&T and T-Mobile for a complete 2G-4G voice and data reception solution. SureCall’s three-year warranty is a testament to our product quality. Standard Supported CDMA / WCDMA, GSM, EDGE, HSPA+, EVDO, LTE, etc. "This is a CONSUMER device. Please note, the four largest carriers - AT&T, T-Mobile, Verizon and Sprint - and more than 90 regional carriers have given blanket consent for use of all boosters certified to the new FCC standards." The innovative zBoost Xtreme ZB545X SOHO signal booster boosts voice coverage on 3G phones for all North American carriers operating on CEL 800 MHz and PCS 1900 MHz frequencies. zBoost ZB545X signal amplifier for Large Home or Office and Light Industrial.